↑ John Pollini, "The Augustus from Prima Porta and the Transformation of the Polykleitan Heroic Ideal", in Warren G. Moon (ed. ), Polykleitos, the Doryphoros and Tradition. 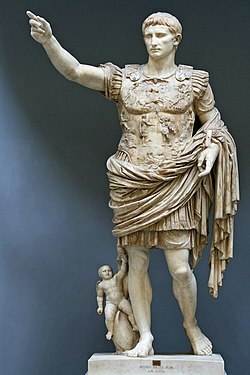 (Madison: The University of Wisconsin Press) 1995, analyses the cultural significance of unmistakable Polykleitan features in the Prima Porta Augustus, presented in aemulatio as the successor to heroic Polykleitan portrayals of Alexander the Great. ↑ Coins were one of the most effective ways of spreading propaganda, such as news of decisive battles and changes of ruler, because on such occasions new coins would be minted. หน้านี้แก้ไขล่าสุดเมื่อวันที่ 8 เมษายน 2559 เวลา 22:32 น.